3 "People say NO war"
5 "NO WAR, NO WAY"
6 "Katrina: A Challenge for the Movement"
Larry Holmes lives in New York City. He is a leader of the Troops Out Now Coalition and the Ad Hoc National Network to Stop Foreclosures and Evictions. 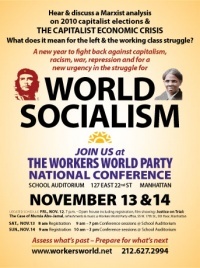 He is a leader of the Workers World Party. April 15, 1978 — In one of the most militant and massive demonstrations held anywhere in the United States since the civil rights struggle of the 1960s, over 35,000 people, the majority Black, Asian and Latin youth, came to Washington, D.C., to voice their total opposition to the racist Bakke case now pending before the Nixon-packed U.S. Supreme Court. Among the speakers at the rally were Grantland Johnson from the National Committee to Overturn the Bakke Decision, Aimee Cruz of Union of Democratic Filipinos, Digna Sanchez of the Puerto Rican Socialist Party, Betsy Gimbel of Disabled in Action, Reverend Bob Pruitt, Joe Malloy, a coal miner and member of the United Mine Workers Union, and Claudette Furlonge of the Women’s Focus of the National Committee to Overturn the Bakke Decision. After the massive Oct. 26 2002 anti-war march, in which the broad avenues surrounding the White House were packed solid with demonstrators, there "can no longer be a shred of doubt about it: grassroots sentiment in the U.S. is opposed to the Bush administrationplans for a "pre-emptive" war on Iraq". People came to D.C., the heart of the federal government, from every state in the U.S. The International ANSWER coalition, which initiated the call for the protest, reported 150 organizing centers around the country. Hundreds of chartered buses caused gridlock in the White House area. Tens of thousands also streamed into the city by car, van, plane and train. Mara Verheyden-Hilliard of the ANSWER steering committee opened the rally and introduced her three co-chairs: Mahdi Bray, executive director of the Muslim American Society Freedom Foundation; Michel Shehadeh of the Free Palestine Alliance, and Larry Holmes of the International Action Center. Shehadeh and Holmes are also ANSWER steering committee members. "Katrina: A Challenge for the Movement"
On Oct. 22 2005 in New York, the Workers World newspaper staff hosted an important forum called "Katrina: A Challenge for the Movement: Forging a united front between the Black liberation, workers' and anti-imperialist struggles." The forum attracted an overflowing multinational crowd of progressives and activists from New York, Philadelphia, Washington, D.C., Boston and other areas. The panel featured prominent African-American representatives based in New York, Raleigh and New Orleans. These leaders talked about the issues of the day from anti-racist, pro-labor, pro-community and anti-war perspectives. In 2006 Larry Holmes served on the Secretariat of the Workers World Party and was Troops Out Now Coalition leader. In 2008 Larry Holmes, Co-Director of International Action Center, New York signed a statement circulated by the Partisan Defense Committee calling for the release of convicted “cop-killer” Mumia Abu-Jamal. The Fifth Cuba/Venezuela/Mexico/North America Labor Conference, with representation from eight countries and virtually every region of the U.S., took place the weekend of Dec. 5-7, 2008. in Tijuana, Mexico. Sponsors of the conference included the U.S./Cuba Labor Exchange; Sindicato Mexicano de Electricistas; World Organization for the Right of the People to Healthcare—Service Employees International Union 1199 NY; International Committee for the Freedom of the Cuban Five; National Network on Cuba; Venezuela Solidarity Network; International Action Center; Cuba Solidarity New York; Southwest Workers Union; and Converjencia de los Movimientos de los Pueblos de las Americas; among others. Larry Holmes of the May 1st Coalition for Worker and Immigrant Rights spoke for Teresa Gutierrez, who was unable to travel due to illness following a trip abroad. He observed that the election of Barack Obama reflects enormous changes in the U.S. working class. The huge outpouring of immigrant workers in May 2006 was the first indication that Obama could win. Holmes noted that the primary reason for the increasing repression of immigrant workers is their ability to influence non-immigrant workers. Holmes emphasized the necessity for Black and white workers to stand with their immigrant sisters and brothers this coming May Day. A powerful march for jobs filled the streets Pittsburgh, Sept. 20, 2009 in the first major protest before the G-20 summit. Organizers estimate more than 1000 people joined the demonstration, which marched from the Hill district, the historic center of the city’s African American community, to Freedom Corner. More than 100 activists and journalists from a variety of organizations, religious groups and media outlets attended a gathering with Iranian President Mahmoud Ahmadinejad at the Warwick Hotel here Sept. 21. The leader of the Islamic Republic of Iran was in the city to attend the annual United Nations General Assembly. The 2010 National Workers World Party Conference was held on Saturday and Sunday, Nov. 13 - 14, 2010, and had the tagline, "2010 National Workers World Party Conference". Opening Plenary Session: The Capitalist Elections, Economic Crisis and Struggle for Socialism: What does it mean for the left and for the working class? Chair: Elena Everett; Speakers: Fred Goldstein, Teresa Gutierrez, Larry Hales, Larry Holmes; Cultural performances by Miya Campbell and Mike Martinez. 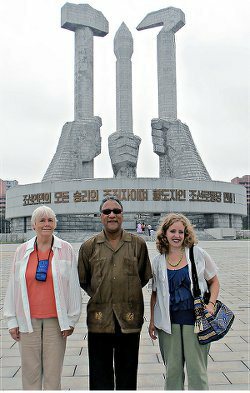 Larry Holmes, Workers World Party’s first secretary, led a three-person, party delegation to the Democratic People’s Republic of Korea at the end of July, 2013. The other two members were Deirdre Griswold and Elena Gilbert.The DPRK was celebrating the 60th anniversary of the end of the Korean War. Our trip has a history to it. We have been developing a relationship with the DPRK for more than 40 years. We were there a full seven days. We had a few political meetings with leading members of the Workers’ Party of Korea. Usually also attending those meetings were delegations of other countries, representing not governments but left parties. The main activity was participating in parades, ceremonies, the opening of museums, a circus, recitals and many performances, with children doing unimaginable stuff to blow your mind. New York City: What’s driving the new ‘Cold War’? Will It escalate? Can we stop it? 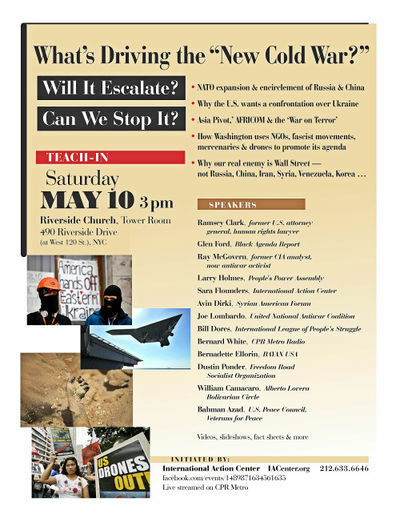 Teach-In: Saturday, May 10 2014 Riverside Church, Tower Room. Dustin Ponder, Freedom Road Socialist Organization/FightBack! Workers World Party delegation at the Cuban Mission in New York to sign condolence book for Comandante Fidel Castro, Dec. 2. Photo: Cuba Mission — with Larry Holmes, Marsha Goldberg, Teresa Gutierrez, Monica Moorehead, Taryn Fivek and Bill Dores at Cuban Mission. This page was last modified on 24 January 2018, at 09:18.